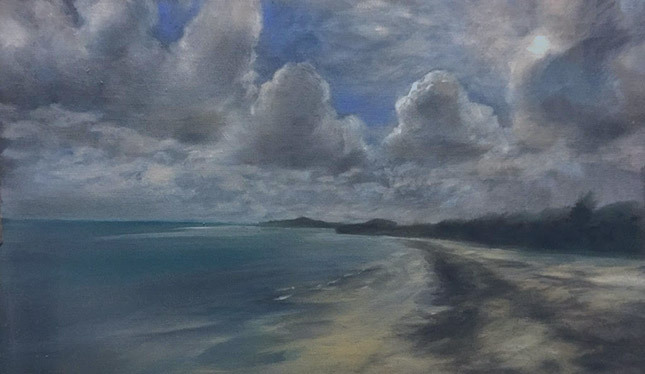 Here's my first St. Croix painting, a view (without houses) from the Columbus Landing Beach, northwest of Christiansted near Salt River. It's oil on linen, about 10" tall by 14.5" wide and is not stretched, so it can be matted and framed with glass or mounted and framed flat, or mounted if preferred. I'm asking $400 for my first picture--below is the matching piece. And this is my second St. Croix painting, a view from the Columbus Landing Beach looking east toward the Salt River Inlet and a favorite. It's oil on linen, about 10" tall by 14.5" wide and is not stretched, so it can be matted and framed with glass or mounted and framed flat, or mounted if preferred. One of the interesting things on the island of St. Croix are the many ruins of old windmills that were used in the production of sugar from cane. With the very consistent easterly Tradewinds it made sense to construct these towers to do the work of crushing and squeezing plants. Those who built them were harkening back to European design and specifically Danish style windmills. All that remains today on St. Croix are these amazing stone conical towers, which at the ground floor doorway are 3 feet thick or more and are constructed of a variety of brick, stone and coral. On the walls you might see a piece of coral with fan striation next to colorful stone. It's a very attractive, eclectic kind of masonry. The blades and vanes of the windmill 'fans' are long gone, as are the superstructures that sat atop and housed the upper mechanism or transmission, if you will. I'm starting to paint scenes and images from TheBuccaneer.com resort near Christiansted and their mill neat their check in point and now used for romantic dinners and as a venue for weddings. 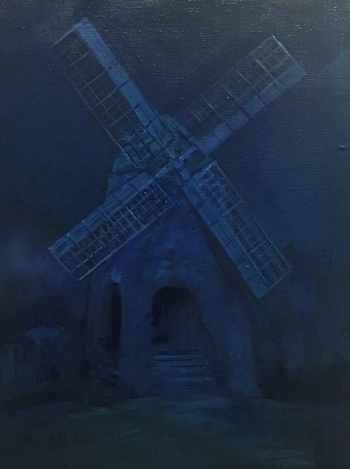 I'll paint many daytime paintings of it, to be sure, but I really like imagining the blades or vanes and other parts, for The Buccaneer Mill and others. And I do love my nocturnes. A gallery visitor recently spotted these and recognized the colors on one as something like a Remington nocturne. I was fortunate to see many of those at the Amon Carter Museum in Fort Worth as well as Remingtons in the Sid Richardson collection and they did have their effect on me. It's amazing how much color one can see in them once you start looking. 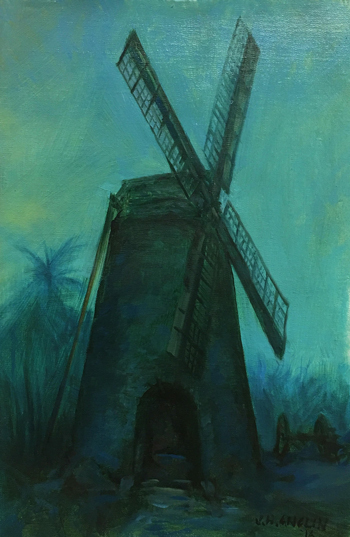 This windmill and the others are fun things to paint! This is a 16 x 20 inch oil on linen, and in process, and probably will be for sale soon at The Buccaneer.